This small line is headquartered at Roscoe, Texas, a few miles west of Sweetwater. RS&P serves a car rebuilder here, and interchanges with the UP. When the line was first constructed, it extended from a connection with the Texas & Pacific at Roscoe through Snyder to Fluvanna and a connection with the Santa Fe. RS&P abandoned its line between Snyder and Fluvanna in 1941. Thereafter, the railroad survived on bridge traffic between the T&P and the Santa Fe until deregulation forced the company to scrap its line between Roscoe and Snyder in 1984. All that remains is its trackage around the car rebuilder, plus a storage track approximately two miles in length. Roscoe, Snyder & Pacific SW1500 # 600 was photographed at Roscoe, Texas in October 1994. 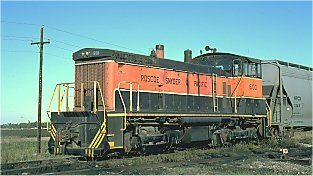 This locomotive is no longer on the property; it was recently replaced by a former Louisiana & Delta CF7.